It’s the chirping of the birds and the cool breeze blowing across the airy rooms of Taylor Hall, the boys’ hostel, that welcomes the students and asks them to wake up as the fresh new day awaits. After doing the morning chores and having a succulent breakfast, the students climb up the famous 96 steps to reach their respective classes by sharp 8:30 AM, the time at which a regular day starts at NITIE. After burning their midnight oil, the students still manage to keep their eyes wide open as the professors, in their full zeal and enthusiasm, are charged up to brim up the students with knowledge and insights about the subject. The lectures generally end by 1:30 PM, post which Sarabhai Hall and Taylor Hall are ready to serve the students with a full-fledged lunch. Then after comes the time to tackle the assignments, projects, case study discussions, pre-readings, etc. The nights are usually reserved for the Summer Internship preparations be it GDs, Interviews or grooming sessions followed by dinner and then preparations for the upcoming day. But this schedule is followed by almost all the B-schools in the country. The question is, “What makes NITIE unique?”. Let me take you inside ‘God’s Own Campus’. NITIE is indeed blessed with the kiss of love from Mother nature. With a lush green campus situated in the Financial capital of India, NITIE is equipped with everything a student needs to beat stress and anxiety that may arise from the rigorous MBA curriculum. 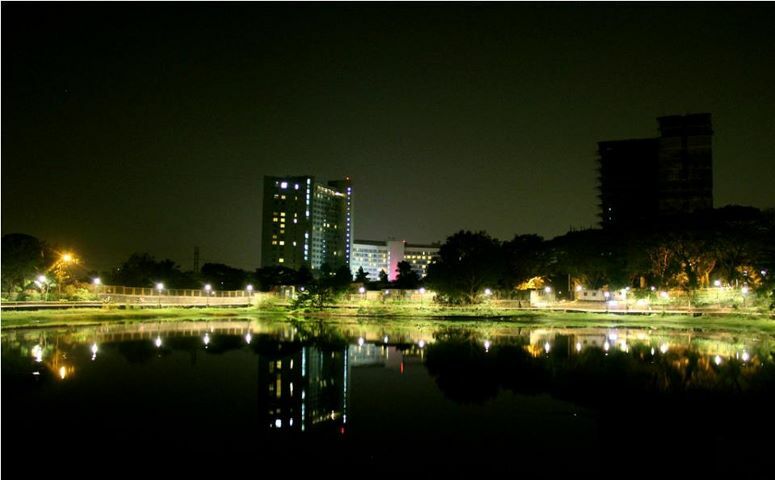 From having a sweet little pond of its own to having the tallest students’ hostel amongst any government institute in India, NITIE provides you with everything that one can ask for. With the kiss of love from Mother nature, the mecca of Supply Chain & operations – NITIE, has a lush green campus which is home to a variety of Snakes, a crocodile and a leopard. Yes, you heard it right! The stories about sighting the leopard especially near the Anand Path are legendary. NITIE’s very own crocodile resides in the pond itself. The snakes can be witnessed in the campus during the monsoons but that’s not a point to worry about. The security guards are usually on high alert to keep them away from disturbing the students. Whatever situation you are in, may it be stress, anxiety, happiness, or even love, NITIE has a spot for each of them. The view of the skyscraper in the night time from the opposite side of the pond is something one must NOT miss. The post-dinner walk around the pond is the most delightful time of the day. All your problems might come to a pause after completing one round around the pond. Even if you’re looking for a romantic walk with your loved one, the campus has enough paths to walk on and ample scenic views to appreciate. One thing in particular that the campus is blessed with is Mother nature’s avatar in form of Man’s best friend – Dogs! Though some of the people might not be happy with their presence, it is the dogs in the campus who are ready 24*7 to cheer you up, to play with you and help you cope with all the stress by their sheer love. With innocence and love in their eyes and wagging their tails whenever they see you, the dogs are always ready to become your true friends. At times you might be brimmed up with their love, but at the end of the day they aren’t there to harm you at all.